We have an ongoing strategic objective to influence more consistent creditor support for those with debt problems. A supportive approach to debt recovery provides a range of benefits for any organisation collecting debts. 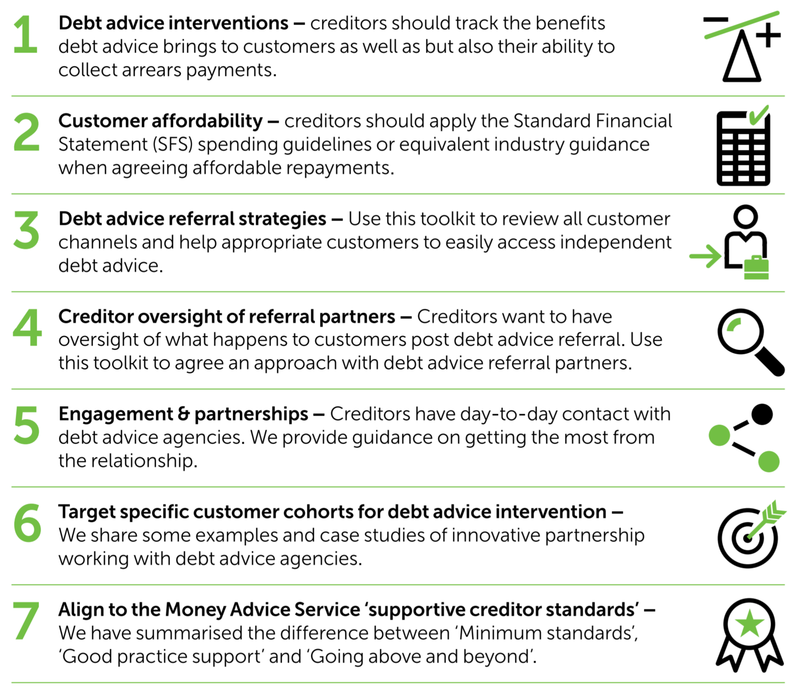 Creditors that work in partnership with the debt advice sector tend to achieve fairer outcomes, better customer engagement and sustainable repayments. Conversely, poor debt recovery practices can have a detrimental impact, disrupting people’s financial circumstances which can lead to disengagement and damage to the creditor’s reputation. Working with our stakeholders, we are producing a suite of resources focusing on specific creditor sectors, taking into consideration their unique challenges in collecting debts. So far this has seen the production of two toolkits – ‘Working Collaboratively with Debt Advice Agencies’ and ‘Supportive Council Tax Recovery’. More information on the resources can be found below. Moving forwards, we will be engaging with other creditor sectors to capture good practices and make recommendations for improving debt collection processes. A new resource to bring consistency to the way creditors work with debt advice agencies when collecting repayments from people in debt. 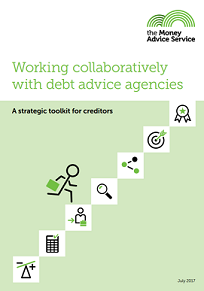 ‘Working Collaboratively with Debt Advice Agencies – a strategic toolkit for creditors’ sets out broad good practice for joint working between the debt advice and all creditor sectors. The resource suits different types of creditors, presenting best practice processes and case studies from creditors that already have effective partnerships in place with the debt advice sector. This will ensure that people who can repay their debts do so and that creditors receive money owed. Strategic guidance to help Local Authorities take a more progressive approach to Council Tax recovery. 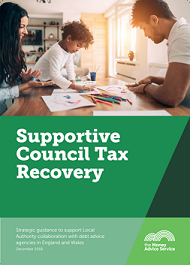 ‘Supportive Council Tax Recovery’ encourages best practice support for those with council tax debts by promoting the benefits of greater collaboration between Local Authority revenue teams and the debt advice sector. 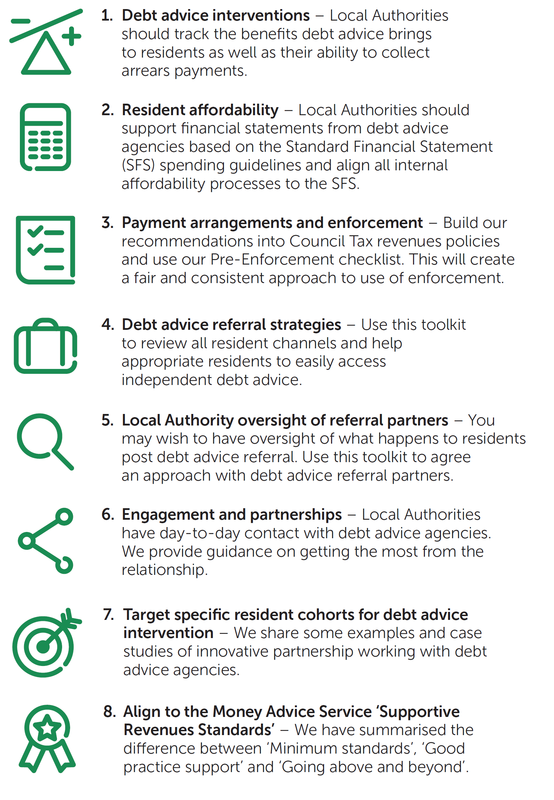 The resource is modelled on progressive approaches to Council Tax recovery already being employed by 10 councils, which show that a collaborative approach with debt advice agencies results in collection of a higher percentage of monies owed. It includes suggested learnings from other creditor sectors with the aim of encouraging the adoption of these best practice methods across all 348 Local Authorities in England and Wales.